Our school districts get paid money by the state when a child is in school. When one is absent the district does not get paid. Before EPISD was a district of innovation the students were required to attend class 90% of the time in order to pass the class. Those numbers are for less than half of a school year. It looks like the kids have figured out the new rules. This entry was posted on Friday, February 9th, 2018 at 5:00 AM and is filed under El Paso Independent School District. You can follow any responses to this entry through the RSS 2.0 feed. You can leave a response, or trackback from your own site. Your schools have become nothing more than glorified babysitting service, for the most part, with education being secondary at best! Oh yes the innovative school districts are getting ready to turn out generation stupid. EPISD and those who support the administration should be so proud! This goes for other school districts in El Paso County. If such school districts as EPISD were doing such great job why are they being left behind in educating the Children that is worse than some second and third world nations? Innovation is the last word that should be used for El Paso school districts except when used when referring to innovative ways they wasted taxpayer dollars and fail to educate the children of El Paso. I’m curious about you choice of words. You say “your schools,” not “our” schools. It sounds like you don’t think that you have a stake in our schools. Everyone in our community has a stake in our schools, whether they like it or not. Do you not live in El Paso? Got smart and left El Taxo Texas but still have family and friends there! Yes would love to see El Paso school districts have far better outcomes in educating the Children but it’s not going to happen! The progressives in El Paso have to keep the downtrodden peoples instock to keep the Democratic plantation going! If the majority in El Paso every do become educated the progressive Democratic plantation politics will not keep them down on the plantation! I agree that El Paso is a plantation, but I’m always amused at people blaming all of El Paso’s problems on the local Democrats when we have high-profile Republicans bleeding taxpayers for ballparks and other tax subsidies for their for-profit businesses. The Ballpark bleeding, just to refresh your memory, was started by the progressive Democrats in El Paso. The Lion share of El Paso’s and county debt thank the Progressive Democrats. The big school bonds for EPISD and YISD thank the progressive Democrats. Hell from the way it look you guys are going to give Cook another round to screw thing up at the County level! One of the leading most heavily taxed communities in the nation with some of the highest levels of poverty. So what has it got you? Schools that can’t educate your Kids, Debts that is bankrupting your locale government. Yep all this can be directly put at the door of the progressive Democrats in El Paso! Yep, enjoy paying for the cost of Porsch government as they delivery to you a Ford Fiesta! El Texo the future Detroit of the SouthWest! It’s humorous to see so many spelling and grammar errors in comments that criticize our education system and today’s students. Write an academic essay making your point. No more than five pages, MLA format, typed, double-spaced, NTR font, properly sourced with footnotes and reference page. Underline your thesis in the first paragraph, which must make only one claim that must be backed up by source material. Then we will talk. Deputy Dawg, I hope this is you. Miss you telling us all how to live properly. You’re the best. Keep giving out IPads. Our kids are getting smarter. If money alone were the determinant of educated kids, all of them would be doing great. Maybe the kids are stupid? Or their parents? It couldn’t possibly be EPISD’s fault. Gracie kinda says it all, right there. Measurements of educational performance from third world countries is ALWAYS skewed. Few get to complete school and way fewer achieve a university level education. Those that do not are simply not reported on when such things are counted and foisted upon the world as if it is gospel showing how much they are equal to or even better than the United States. A tiny bit of research, witnessing any of these countries first hand, and even just an itty bitty bit of common sense might allow one to realize that all of that is complete bunk. But, we ARE getting to witness it here in El Paso first hand! Slowly over time. As the administration of schools and city get more and more corrupt and dedicated to a certain political narrative and a third world cultural narrative to the exclusion of all else, the more entities like EPISD and El Paso itself begin to look and eventually become “third world” in their nature. It is not all the way there yet! But, the way things like this happen, is slowly. Step by ever downward step. One day, we will all wake up and see nothing else all around us. I wonder if this attendace issue has to do with being a District of Innovation as much as changes in the LAW in the State of Texas regarding school districts being allowed to take students and parents to court for attendance issues. EPISD does not make state law, that is done by the people elected by the citizens. So yes there is a loophole created by the lawmakers we elected. Read the article linked below. Under the old law students could be taken to court for 10 Unexcused absences in a 6 month period. Under the new law if a student has 10 unexcused absences in a 6 month period they are given a letter. Yep, that’s right, a letter. Brutus really needs to research some of this before he throws this stuff out there. Blame and hold EPISD accountable for their issues, absolutely. To say it is EPISD’s fault on an issue due to state law change is irresponsible and reckless. “The letters” are ineffective. Parents get placed on a 45-day plan. Nothing happens. No accountability. IF and when parents get taken to court, it would be approximately a year or more (do NOT hold your breath- district and campus admin are afraid of its critics). There are no consequences for unexcused absences or tardiness. Gone are the days of 3 tardies = 1 unexcused absence. Students are allowed to make up work regardless if the absence is excused or unexcused so parents know the work is going to be able to get done. No zeroes recorded equals no sense of urgency to make children come to school. Students are not made to FEEL bad about missing school because their self esteem may be damaged –(of course, until your campus starts feeling the heat of high attendance rates and then there is a 180 perspective on that nonsense). The post did not blame EPISD for anything. Implying it was due to EPISD being a District of Innovation is implying it was due to their actions. Thank you for caring enough to engage in the dialogue. The only time parents are taken to court in most cases is if you have an aggressive Justice of the Peace. 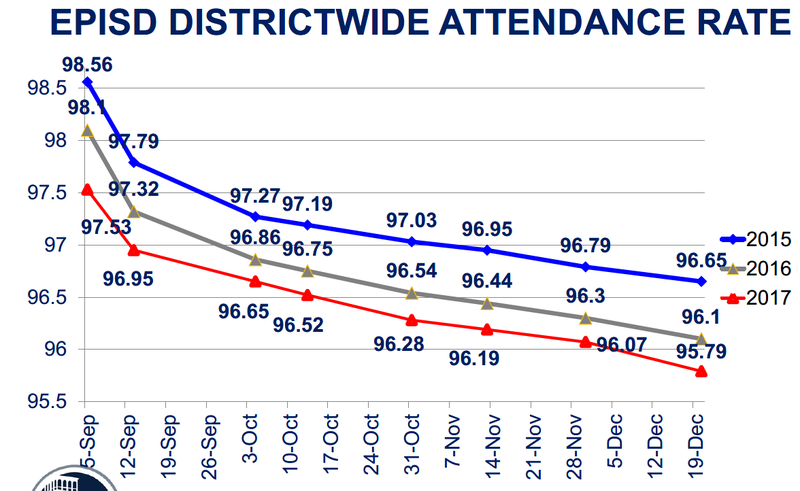 The EPISD administration is very weak on enforcing attendance because it will upset its “customers,” the parents. One westside high school for certain has quietly intimated to its teachers to be “more gentle” with students absences and tardiness to keep the customers happy. Kids need adults to set an example, too. Note the politicized EPISD school board and the antics of Ms. Byrd, Cabrera (gone 100 days last year), and others, No one is thinking education; they are thinking how can I use this gig to advance my career. If you are one of the controllers who put Cabrera in office and Carmen A-C in charge of the numbers, then you are thinking how can I use EPISD to make money off the district. No one cares about educating kids. Those numbers could also denote new standards and/or a serious effort in verifying attendance reporting. 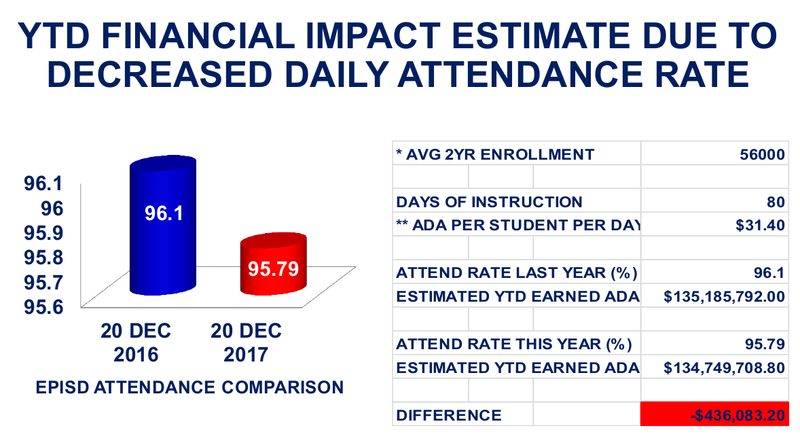 For decades schools have consistently been found to misreport attendance as they have a very powerful motivating factor for doing so: money. Public schools have never been about educating children, if it were there would be sufficient motivation to make sure children are learning. Instead, every teacher who expresses an opinion will tell you that they hate any effort at standards based learning determinations which would establish whether children are learning anything. Teachers also always say they are worth more money, despite the fact that actual results would demonstrate a long-term downgrade in the education level of public school students. Do some research on what we spend on education and our standing in the world regarding education levels. Third-world countries have much higher results for math, reading, spelling or any other important component of education. The reason some third world countries have better results is because the kids go home to parents who see an education as the path that will let their kids live better than they do and they push their kids to do well. Here, too many parents see school as daycare. I worked in Mexico for four years and a lot of the degreed people I worked with came from families with parents who never finished grammar school but pushed their kids to get degrees. I’ve seen the same phenomenon in Asia. Actually Dan, we lost jobs to China because back in the late 80s and 90s, they offered five year corporate tax holidays to companies moving factories over there. Then they devalued their currency 30% to wipe out the logistics cost advantage. By that point the supply chain had moved over and was selling components cheaper to Chinese manufacturers than to US manufacturers. The labor cost in most electronic products is less than five percent of the total manufacturing cost. Fortunately, that situation is reversing itself. But it doesn’t change the fact, that a country that didn’t put a man on the moon outfoxed us economically for three decades through very focused government policy. Sorry to get intellectual with you Dan, but it is what it is. How many of the countries ahead of the US allow all of their children an equal OPPORTUNITY for an education? And how many of these countries put a man on the moon 48 years ago? That kind of thinking is why countries like China have successfully gutted our manufacturing and stolen our IP to leapfrog ahead of us. We can’t rest on our laurels in a global economy. Mexico does not provide free education for ALL their children. There are not enough teachers or schools so some children (after elementary) do not have access to a school. Parents here are to blame for their children’s crappy education. Schools are not allowed to discipline children because the parents complain. Liberal beliefs have led to schools adapting such programs as dual language.Dual language works for the native English speakers but fails to prepare the Spanish speakers for the real world. I do not know the answer but I do know El Paso schools are an abomination. And EPISD is stuck with Board members, like Suzie Byrd, who put their own agendas first. That is not a recipe for improvement.